A fun new 360-degree video uses spatial audio to bring to life some of the different ways consumers might use the new Honda CR-V.
A couple laughs by a campfire on a wooded getaway. A welder takes a blowtorch to a sculpture. 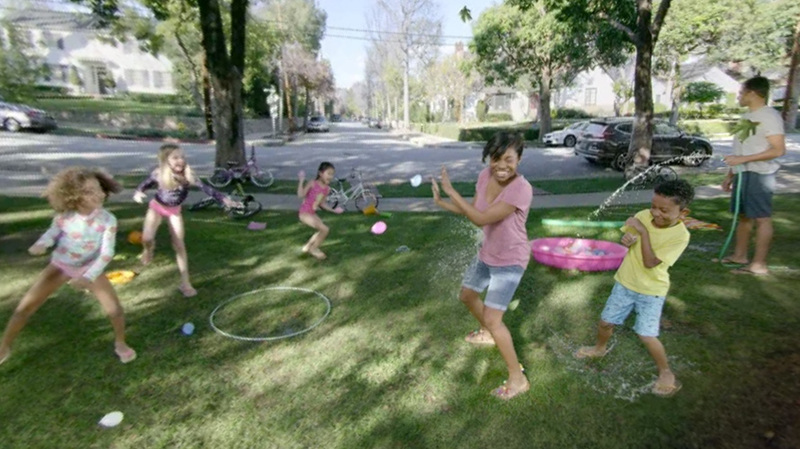 A group of kids throw down in a water-balloon fight on a suburban street. All three freeze-frame scenes are stitched together in the clip, which lets viewers rotate the camera’s perspective to see each one—while serving up audio that shifts at the same time, as if you were actually there, in the actual environment, hearing a sound coming from a particular direction as you turned your head. See the ad on Facebook here. In other words, the crackling of the fire intensifies as you look directly at it, and fades into the hissing of a power tool as you change focus, and gives way again to the giggling of children at play and trickle of a garden hose. It’s a VR mixing gimmick that leverages a relatively new capability from Facebook, and is sure to become increasingly popular as artists and marketers try to make experiences that are more realistic (that is to say, more immersive and convincing escapes that better trick your brain and its sensory apparatuses). Honda and agency RPA took the targeting aspect of the idea a step further. The video starts on whichever of the three scenes is deemed most relevant to a particular viewer, presumably gleaned from Facebook data (a late-20s male city-dweller got the couple’s camping adventure, for example). Whether that’s likely to add to the efficacy of the campaign or be presumptive and off-the-mark, it’s easy to see the overall concept casting a wide net by teasing different niches—people looking to pack their SUVs with tents and coolers for that next trip to nature, or scrap metal for that latest craft project, or a bunch of tweens for a short drive to soccer practices, or all of the above—at least in theory. Small movements—like a cat’s shadow in an upstairs window, and, naturally, a passing CR-V—are meant to help draw the viewer’s eye from scene to scene. Those are welcome relief—the otherwise-still visuals border on awkward, a condition further ameliorated by the playfulness of the audio. In other words, for reasons aesthetic or budgetary, the clip is in some ways very simple, but still effective at heightening the sense of presence—of actually being there—in large part thanks to the spatial sound. If it makes you want to spring for a CR-V more than any other SUV is a different question. But if it’s got you asking, that’s probably a good enough start.